With a name like “Soup Up Your Site” it should be obvious what we specialize in… we make websites fast. In fact, we make websites blazing fast! In most cases, we can make your website faster than 90% of all sites on the Internet! Even if you have a website on a mid-range or even low-range server, we can leverage technology to make your site even faster than people who are on the latest and greatest servers on the Internet! How? Because we know how to optimize a website to take advantage of every bit of power that your server offers. 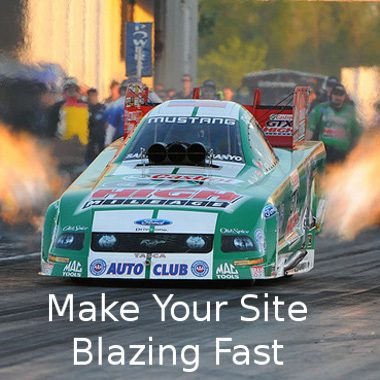 We guarantee that your site will be blazing fast. If it is not, we will keep working until it is! For fair testing of site speed, we use the industry recognized tool, Pingdom to see just how fast your site is. We test it before we do any work, and then we test it when we are done to see how we did. Usually, when we have optimized a site we can score well into the 90+% percentile on Pingdom. We guarantee that we can get your site about the 80th percentile, but in most cases we can even exceed that. Let Us Speed Up Your Site!